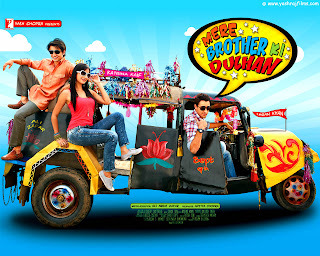 Yashraj is back again this time with Mere Brother ki Dulhan, with Imran Khan (Kush Agnihotri), Ali Zafar (Luv Agnihotri) and Katrina Kaif (Dimple Dixit). Slated as a Rom-com and a family entertainer as usual. The movie starts with Luv, the investment banker in London, breaking up with his girlfriend Piyali (Tara D’Souza) of 5 years. Suddenly reality strikes him and he calls up younger bro Kush to find a girl for him to be married to. Reason: when they were kids, they both liked Madhuri Dixit. So he trusts Kush’s choice in women. Kush and parents go on a bride hunting spree and finally land up with Dimple Dixit as a choice. But here lies a shocker. He knows Dimple from his college days where she was as wild as she can be. Predictably, the family likes the alliance and they are all set to get Luv married to Dimple. With the preparations, Kush feels attracted to Dimple but is not really aware of it. Kahaani mein slight twist happens with Luv coming down to India for the wedding. And with that Kush n Dimple realize their feelings for each other but do not know how to get out of the engagement. Putting their brains together, and infused laughter situations to sort this out is the rest of the story. And since there is no cog in the wheel, one gets created to just extend the story. All’s well that ends well. Directed by Anurag Kashyap and starring Kalki Koechlin the movie is a dark, intense and hard hitting portrayal of the life of, that girl in yellow boots. It is co-written by Anurag and Kalki. Kalki is Ruth, a British citizen in Mumbai looking for her father who left Ruth and her mother when Ruth was five years old and her step sister committed suicide. Years later, Ruth receives a letter from her father and sets off on a journey to find him. This journey takes her from the government offices to have her visa renewed to a spa where she works as a masseuse. In this realistic portrayal of Ruth's journey the camera weaves in and out and takes you into the massage parlor where middle-aged and the young turn up for a massage and maybe something more. Ruth's boyfriend Prashanth (Prashanth Prakash) a drug addict who gets into a debt with a local gangster Chutiyappa (Gulshan Devaiah) who strangely enough is a Kannanda (language of southern state in India) speaking don and who is determined to collect his debt from Ruth. While it may seem like parallel stories the entire plot comes together in a slick manner and with a common focal point of that girl in yellow boots. What this movie does is take you on Ruth's journey. Right through the lewd lascivious looks of the government officials, the lecherous 'hafta' collection of the policeman, the painful and disturbing behavior of the druggie boyfriend, the gangster whose emotional weakness is the story of a drunkard father and to the final climax of finding her father. Your journey is as involved as Ruth's and while the ending may seem predictable, what Anurag does through smart casting and some deft twists is ensure you do not guess it exactly. If you are looking for some fun and entertainment go watch bodyguard instead. If you are looking for some involved serious film-making then go and watch this one, again and again. Amazing performances from Kalki, Prashanth and Gulshan. Looks like Kalki has stamped her authority on any 'expat' kind of sensitive role. The cinematography is beautiful and caresses the streets of Mumbai, the dingy government offices and sets a tone for this movie while will add to the lump in your throat when it ends. What is possibly the only let down of this movie is that it could have been so much more but in trying to bring together various facets through various characters tends to weaken the 'search for the father' theme.